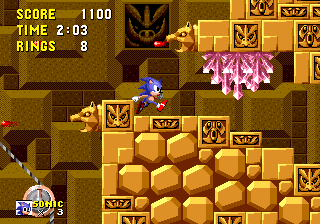 The Fire-Breathing Statue (火を吹く石像) is a level obstacle from Sonic the Hedgehog found in Labyrinth Zone. Statues are fixed to the walls, and repeatedly blow small fireballs in the direction in front of them. Unlike badniks, Statues can't be destroyed, and touching the Statue itself does no harm to Sonic. Interestingly, although some of these statues are found underwater, the fireballs can still harm Sonic.